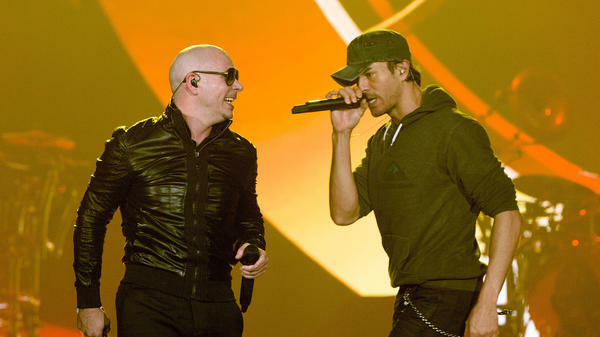 Pitbull and Enrique Iglesias perform outside of Miami in Rosemont, Illinois in 2015. Let not the rising tides that hug South Florida scare you. You don't really have a choice, anyhow, because this song and its forthcoming music video are going to get millions of views, whether you're paying attention or not. Enrique Iglesias and Pitbull just dropped their new single "Move To Miami," so off you go. Iglesias' last single, January's Spanish-language "El Baño," outperformed Taylor Swift's "End Game" with Ed Sheeran and Future from that same week, the former's now-228-million views on YouTube and 122 million listens on Spotify dwarfing Swift's 151 million views and 99 million streams. The Spanish crooner and Cuban Mr. 305 both grew up in Miami and have collaborated before, most notably on 2010 fist-pumper "I Like It." The song is Iglesias' first English-language single since 2014's "Bailando." "She gon' make you move to Miami," the two sing of the young woman who will simultaneously intrigue you and cause you extreme stress about your imminent move to such an expensive and infrastucturally imperiled city. It's OK; Miami is the "booty-shaking capital," so whatever hubris the city has is perhaps well-earned. The objectification here is obvious, and the sexualization of Latina women in reggaeton is nothing new. But there's some small pride to be had of a woman so good at scamming men for drinks and time that she can draw them to her city like the tide to land. And Miami, no less: the epicenter of Latin America in the United States, and one of the few American cities where the Latina body is in the majority, normalized and celebrated. "Ya tu sabes, man," Pitbull sympathizes before the song descends back into the skittering merengue piano riff heard so many times in living room dances to Oro Solido's "Moviendo Las Caderas." Before you know it, you're eating pastelitos, stuck on the 836 on the way to pick up your new girl's abuela in chancletas. Dale, bro.